Draw around a cup to make a circle on the foam and cut out. Cut out a rectangle of green foam about 10cm by 15cm. Roll into a tube and use the double sided tape to join together. Cover one edge of the tube in glue and stand in the centre of the circle. 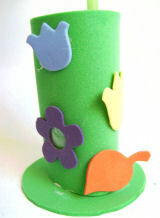 Glue the foam flowers on to the vase and then leave to dry.